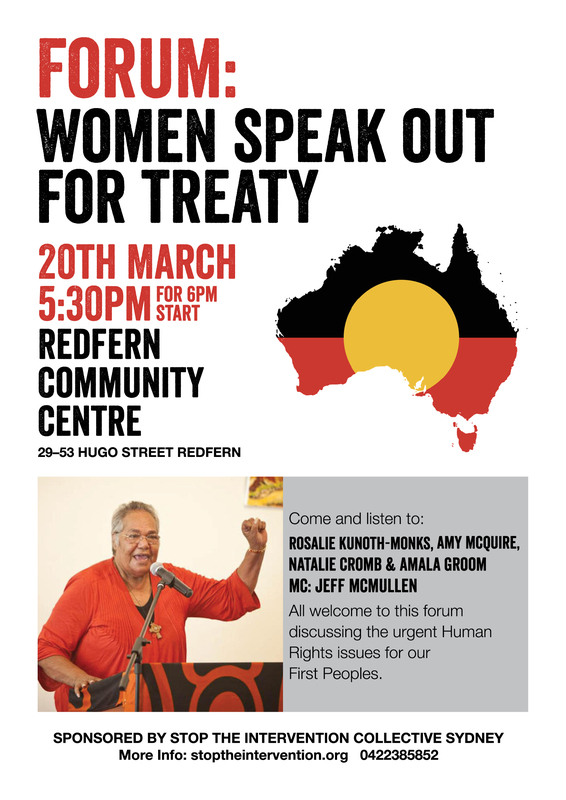 "On 20th March, Stop the Intervention Collective Sydney will host a public forum in Redfern to mark the International Day for the Elimination of Racial Discrimination 2015: First Nations Women Speak out for Treaty." Redfern Community Centre, 29–53 Hugo Street, Redfern NSW 2016"
Facilitator: Jeff McMullen, journalist and film-maker"
"Treaty would recognise the sovereignty of the First Nations People over their land and enshrine the right of self-determination which was promised to them when Australia ratified the International Covenant on Economic, Social and Cultural Rights 40 years ago. The forum will also discuss the relationship between Treaty and the current campaign for constitutional recognition." "'Day One' of the Sit-in was successful in gaining world attention, due to government 'spill' being moved forward by a day. The Aboriginal Sovereign Manifesto of Demands was delivered in person to both sides of the Commonwealth government. "We, the Aboriginal Sovereign Peoples with the National Aboriginal Freedom Movement demand that the Commonwealth of Australia begins negotiations to establish a time frame for our decolonisation, through Treaties under the Vienna Convention on the Law of Treaties with the legitimate authorised representatives of each Nation State. This will form the basis of the recovery framework for the healing from the devastation wreaked upon Aboriginal Nations and Peoples by State sanctioned genocide and gross violations of human rights. ... ""
18 Aug 14: "The message from very many Aboriginal Peoples in Australia to the Australian Government is that the time is long overdue for genuine negotiation on treaties." "Aboriginal Peoples of Australia have been waiting for more than 200 years for formal and binding agreements with Government. They want the opportunity to take control over their lives and to determine their futures through legal agreements, compacts, covenants or treaties established in law and enforceable through the courts." 19 Aug 14: "While currently the focus is on constitutional reform, a new video renews calls for treaty with First Nations, writes Amy McQuire. A new YouTube campaign, narrated by Aboriginal actress Kylie Belling and featuring a number of strong Aboriginal women, has been launched to reinvigorate the call for a treaty. The group Concerned Australians ... launched the YouTube video today. In it, Ms Belling, who starred in The Sapphires and The Fringe Dwellers, calls on governments to finally recognise Aboriginal control over their own lives and futures. ... " By Amy McQuire, a senior reporter with New Matilda. She's the former editor of Tracker magazine and the National Indigenous Times. 16 Feb 15: "Aboriginal Peoples of Australia have been waiting more than 200 years for Treaties. Time to talk Treaties!" 9 Feb 15: "Treaties and Constitutional Recognition are both important issues. They are independent of each other. There is no particular order in which these important changes should be made. "Canada has its centuries-old treaties, and more modern treaties today, and more recently, constitutional recognition of Aboriginal Canadians in the life and history of that nation." Mick Dodson, July 2007"
10 Mar 14: "Let’s Talk Treaty panelists include, Wayne Butcher, Monica Morgan, Warren Mundine & Nicole Watson, hosted by Tiga Bayles." "We all know Yothu Yindi’s hit song Treaty. But what is Treaty? When it comes to relations between Indigenous peoples and colonial powers, treaties are simply formal agreements that set down the terms and conditions by which two or more groups can coexist. The British Empire signed treaties with many of the tribes of Americas, and the Maori of New Zealand. But no treaty was ever signed with the First Nations here." 12 Nov 13: "Chaired by Wheeler Centre director Michael Williams, with speakers George Williams, Mark Yettica-Paulson, Mick Dodson, Peter Sutton, Tony Birch and Gregory Phillips." " ... Many believe that a treaty is essential - our neighbour New Zealand and contemporary Canada have established treaties, recognised by the UN ... In this video, our panel debates the need for a treaty – and the way to achieve true reconciliation." "This book explores the current inadequacy of the process used in engaging with Aboriginal people, which results in control slipping away from them. It provides concise but incisive account from recent reports about the reasons for the ongoing and growing frustration of many Aboriginal people in the NT. In doing so it hints at possibly the only solution - treaties." 31 Mar 98: "The Old Country is now talking through the Fire. Be Aware. It is time to listen to the ancient voice, the Sovereign Voice, the ancient energy of the land. This is the true government, the true authority for this country. All members of the parliament of the Commonwealth of Australia are invited to begin the process of becoming lawful in this land." * Audio: Dom Vukovic, 2SER - Real Radio: Indigenous recognition in the Constitution, what does it mean?